When former NBA standout Etan Thomas was in high school in Tulsa, Oklahoma, he once faced the difficult dilemma of participating in a district debate competition or playing in a regional basketball game. That’s to say that Thomas didn’t suddenly become woke during a nine-year career where he was just as apt to make an anti-war speech in front of a crowd of 100,000 people as he was to trade elbows with Dwight Howard in front of 20,000 fans. 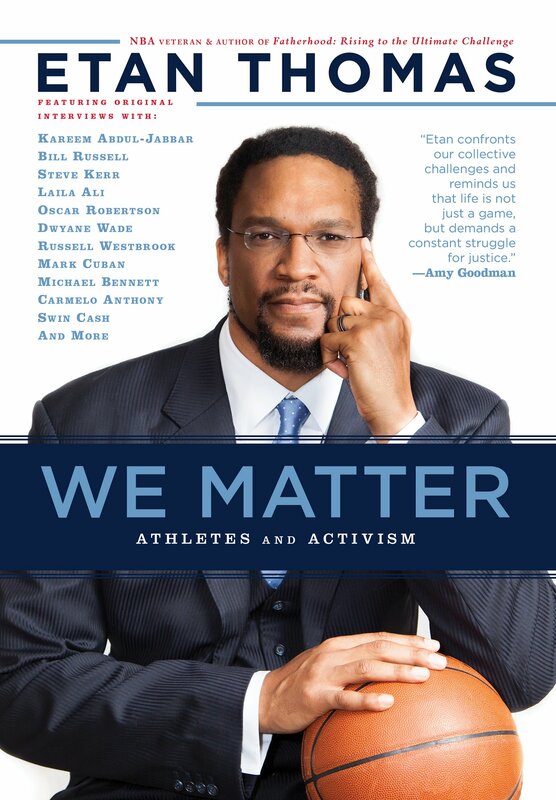 This week Thomas released his fourth book, We Matter: Athletes and Activism, which features interviews with current and former athletes, executives and family members of some of the more prominent victims of police shootings over the past decade. Thomas sat down with The Undefeated to discuss his new book. What led you to write this book, and why now? Right now so many athletes are using their positions and platforms to speak out on different things and different topics that are dear to their hearts, and doing so in a way that’s unprecedented since maybe the 1960s. It was an honor to be able to interview these athletes like Kareem Abdul-Jabbar and Bill Russell and Oscar Robertson. My mother was a teacher, so these are the athletes that she taught me about. When I interviewed John Carlos I told him I had his poster on my wall when I was growing up, not because of how fast he was running but because he had the courage to stand up with what seems like the entire world against him at the 1968 Olympics. I also spoke to current athletes like Carmelo Anthony, Dwyane Wade and Russell Westbrook, and it was really great to make the connection between past and present athletes. How much did your mother being a teacher influence your path as an activist? You played a couple of years with Michael Jordan, who was often criticized for remaining silent on social issues. Do you think he could have made better use of his platform? That’s a tough question. I played with Michael Jordan in his two years [with the Washington Wizards] when he came out of retirement. I’ve had so many in-depth conversations with him about politics and current events. He wasn’t as apolitical as everybody thinks. But he didn’t say a lot of things publicly, and that was his choice and that’s a choice that I have to respect. The book shows it’s a different time period now. Even if the prevailing notion back in the day was ‘If you say something you’re going to be punished,’ I want to send the message that my experience hasn’t been that. So no one ever attempted to silence you when you played? They told me all the time to be careful. But that was out of concern and not a threat. I had no problems with [Wizards owner] Ted Leonsis, Mark Cuban or Jim Boeheim at Syracuse, all of whom I speak to in the book. The advice Boeheim gave me was, ‘When you speak out, you’d better be able to back your position up.’ No one ever said that I would be punished. I never received a message from management saying I should never do that. But remember: We didn’t have social media back then (Thomas played his first NBA game in 2001). That time was completely different. In 1991, Craig Hodges handed President Bush a letter spelling out problems in this country, and a few years later Mahmoud Abdul-Rauf didn’t stand for the anthem. Both were soon out of the league. Did that cause players to fear speaking up? No question. I interviewed both of them and I asked if they would change anything. They said no. When you stand up for what you believe in, no matter the repercussions, you can’t give up your soul to acquiesce to somebody else. One of the things I wanted to do with this book was to tell those stories to encourage young athletes to use their positions, to use their platforms. And you’re seeing high school athletes band together, and college athletes like the football team at Missouri and what they were able to accomplish by just threatening a boycott. If you’re a country and you go to an undeveloped country, set up shop and pay the people pennies while you make millions, on the surface you might say, ‘Those people are better off by having those pennies.’ OK, maybe so, but it isn’t fair. It isn’t ethical. Speaking of college athletes, do you advocate for players getting paid? Kareem is very vocal about this topic. He talks about how much he loves UCLA and how much he loved his experience there, but he also talks about how much they exploited him. It’s amazing to see someone of his stature make a statement like that. When you see the actual numbers with the NCAA, it’s a business. OK, maybe so, but it isn’t fair. It isn’t ethical. You have to think of it in those terms. The big news story recently was LeBron James being told to shut up and dribble. Why do you think a segment of society is so against athletes having a voice? That speaks to a bigger topic. It’s hard right now for us to disagree without being disagreeable. We should be able to sit down and voice our different opinions without having to attack each other. And that’s what usually happens, and athletes bear the brunt of that. Bill Russell once said, ‘You’re not going to reduce me to a clown that’s used to entertain your circus.’ It’s such a powerful quote. You have to respect me as a human being, and I have opinions just as you have opinions. And while I am a basketball player, I have a right to voice opinions. And it’s OK that you disagree with me. People saying athletes should just shut up and dribble is not a new notion. This is something that athletes who have spoken out have always been told when somebody disagrees with them. Now it’s OK when they agree with you. But as soon as athletes say something they don’t agree with, that’s when you get a Laura Ingraham-type response. In the book you also interview family members of Trayvon Martin, Eric Garner and Philando Castile. Why are their voices so important? Awareness about the deaths of their loved ones were raised by athletes. And I wanted to interview the individuals who were directly impacted by the big stories of today. #enoughisenough from @realjohngray – A terrorist in New Jersey bombs New York has a shoot out with cops and gets grazed with a bullet. And safely arrested. A man with car trouble in Tulsa gets TAZED then shot. And then they stand there. Don't offer him aid, comfort, nothing. No gun. No criminal activity. And I've heard people say "he should have complied". As if that has ANYTHING TO DO WITH KILLING AN UNARMED MAN. Stop making excuses. His color got him killed. If that was a well dressed non-black female, do you think the helicopter pilot would have said "she looks like a bad person" in the same manner they said Terrance Crutcher "looks like a bad person"? Of course not. His color was the only thing that made him bad. From 500 feet in the air. I'm tired man. And I'm scared. Cuz I'm big and my skin is brown. Lord don't let my car break down, don't let me be in the wrong place at the wrong time. Don't let me reach for my phone or do anything threatening. Jesus help THIS NATION. With the shooting of Terence Crutcher in Tulsa, his sister told me how she broke down after seeing Russell Westbrook speak out about the shooting. She said, ‘Oh, wow — somebody actually cares.’ Hearing those stories, those were tough to do. I interviewed Trayvon Martin’s brother, and he told me that people really started paying attention to the story in a big way when LeBron James and the entire Miami Heat team wore hoodies. The Trayvon Martin killing affected a lot of athletes because they had sons. That made it very personal. And that’s why the Miami Heat took that photo. It was an iconic image. Like the picture when Kareem and Bill Russell and all those other guys were supporting Muhammad Ali, I think it’s one of those pictures that will go down in history.